NOISE interferes with workplace communication and efficiency. NOISE increases worker health risks such as hearing loss and muscle tension. NOISE lowers morale and productivity on the job. Flexzilla® air compressors are the quietest on the market, operating at noise levels no louder than a normal conversation. All Flexzilla air compressors feature Quiet Technology™, which uses large, low-RPM pumps and motors to reduce high frequency noise levels while increasing CFM output. Because they run slower, Flexzilla compressors also run cooler for less tank condensation and longer component life. Flexzilla stationary air compressors include the Silencer™, a patent pending noise suppression system that uses baffles to reduce low frequency noise. It also filters incoming air and keeps your air system free of contamination. The 10 HP Flexzilla Pro Air Compressor delivers comparable CFM performance to an expensive rotary screw compressor – up to 39 CFM – and is the only 10 HP two-stage compressor with a single-phase connection. Already have three-phase power? We’ve got you covered there too. Raising the pump from the mounting deck allows air movement 360 degrees around the pump for cooler operation and less moisture condensation inside the tank. All Flexzilla® Pro stationary compressors come with an automatic tank drain, a continuous-run feature that reduces wear and tear, and an exclusive 6-year parts warranty on all 7.5 HP and 10 HP models – the longest coverage in the industry. 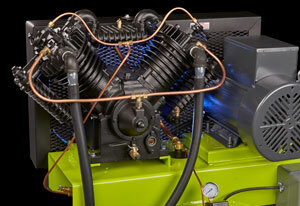 The 5 HP compressor comes with a 4-year parts warranty. Flexzilla air compressors are assembled in the USA with U.S. and global components. The tanks are made in the USA with U.S. steel. Ready to bring quiet back to your workplace? We’ll let you know when we begin taking orders.